So you’ve started a low carb Keto diet, congrats! The key to keto diet success is to meal plan and prep ahead. 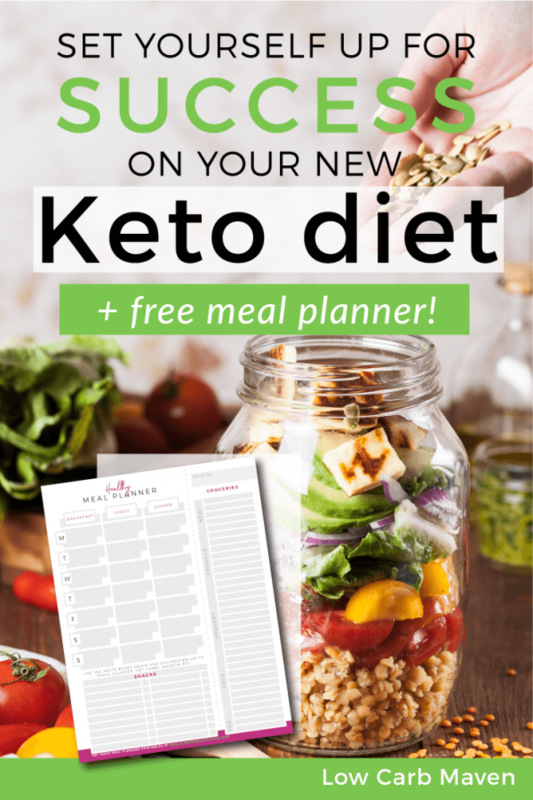 Set yourself up for success on your new Keto Diet and save time & money, shop less, have less waste, and keep track of your macros by beginning new habits and planning in advance. I’d bet my bulletproof coffee you’re here because you really want to stick to your new healthy lifestyle. Planning and prepping ahead will be your best friend. I’m the first to admit, when I start something new I go ALL out. “I’m going to become a runner.” —> map out a 3 mile circle from the house, buy new running shoes and a tracking device that goes in said shoes (this was before FitBit’s time…), a new pretty health journal, etc. “I’m going to read more books” —> make giant book list for the entire year, order 5 books and another pretty journal to take notes, unplug the TV from my bedroom, etc. You get the idea. Seriously. I did those things. So I get it, we want to just “be there” already. But I’m learning it’s the small steps that we take over and over again that will get us there before we know it. I’ve been reading this amazing (yet simple!) book The Compound Effect which is teaching me exactly how little steps will make a big impact. Get it out of the house! Have a talk with your family members if you have to so they can be supportive. If it’s unrealistic to completely remove it from the house, put those tempting snacks somewhere you won’t see them on a regular basis! If it’s in the fridge, try a solid colored plastic shoe box so you can’t easily see the contents. Keep snacks pre-portioned, especially ones that are easy to overeat like nuts, seeds, pork rinds, etc. Some more snack ideas: beef or turkey sticks, sandwich meat (1 carb or less per serving), cheese, fresh vegetables, deviled eggs, yogurt. When you’re hungry and stressed out over being hungry, your mind will inevitably draw a blank. 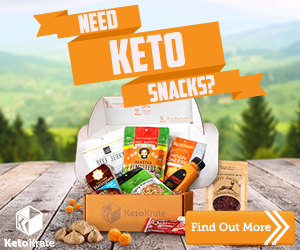 If you have a list of Keto-approved snacks, it’ll be that much easier to grab something you won’t regret later. Having your meals planned and prepped ahead is THE way to succeed with your healthy lifestyle and having a dedicated set of plastic or glass containers just for your Keto meals will totally make your life easier! If not everyone in your family is following the Keto plan, don’t make individual meals. Try deconstructed meals instead so everyone can make it how they want. 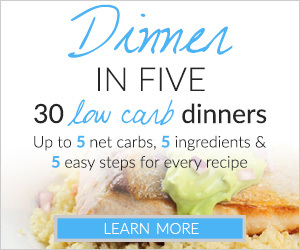 Think: low carb tacos, great bunless burgers, salads, keto noodle-style bowls, etc. Make your math easier, and keep it simple by limiting your meals to 5 carbs each. Green tea has antioxidants that naturally reduce inflammation and has about 1/3 the amount of caffeine compared to a cup of coffee. There are so many different flavors and blends to keep it interesting! Bonus: you probably won’t be tempted to add cream and sweetener to it! The detox effects that a hot (but not too hot) cup of lemon water has on your liver, pairs perfectly with the Keto diet. I used to be a “give me coffee” zombie in the morning and I found a cup of hot water with 1/4 lemon squeezed into it gave me the wake up I needed and the “warm cup of joe” feeling I loved. Make a commitment to yourself that you’re going to stick to this for X amount of days, and then you will ___ (reevaluate, set a new goal, reward yourself, etc.). No writing “forever and ever” – remember we’re going for small steps here! This will help you in those moments you want to give up so you can say “I committed to myself and I only have __ days left”. Get your FREE PRINTABLE MEAL PLANNER when you sign up with Meal Planning Blueprints, below! 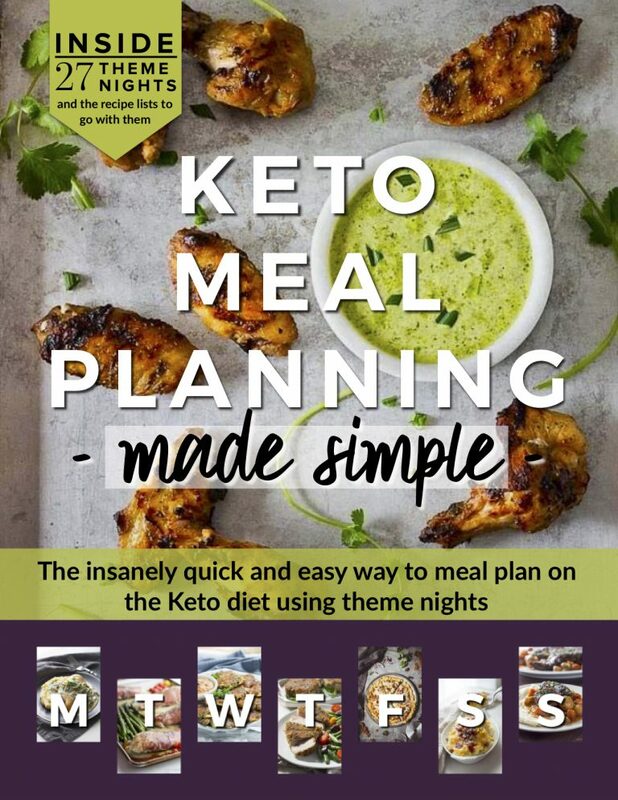 Thank you to Elisa Giorgio from Meal Planning Blueprints for writing this helpful article on keto diet success. 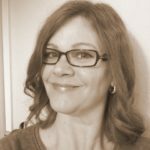 Her expertise is invaluable to all of us trying to succeed on our Low Carb Keto Journey! Follow her on Facebook and Instagram. Elisa wants to live in a world filled with every color sharpie at her disposal, a magic broom that follows around small sticky fingers, and where home means the beach is right outside her window. 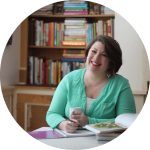 As a blogger, organizer, and expert meal-planner, she’s helped thousands of moms learn how to simplify their lives. When she’s not writing or creating courses to help mamas get organized, you can find her whipping up some spinach artichoke dip, reading at least 3 books at any given time, or explaining why it’s not a good idea to stick markers up your nose — for the eleventy-hundreth time. I’ve looked at a lot of Keto sights. Yours is the only one that is down to earth & friendly. The recipes are simple to make. Tthey don’t require a lot of things I would not normally use. I am still getting use to the different flours & sugar subsitutes to use. I live in a small town in South Dakota & it doesn’t carry some things. But I can order it on Amazon! Wow! thanks for sharing such an informative article. Learnt a lot today from you. Is it important to make a meal plan?